Last year's dress trends were bold, statement-making and full of drama. The good news? The trends for 2018 are every bit as fun. While summer was all about rustic linens and bold button details, autumn brings a more brooding mood—with everything from dramatic, ankle-grazing midis to edgy leather looks taking off in a big way. If you're in the market for a showstopping, mood-lifting frock, you've come to the right place. We've rounded up the best styles (as already seen on some of our favourite street stylers and influencers) to try now. From punchy brights perfect for lifting your mood to sleek, minimalistic frocks that are guaranteed to see you through wedding season and beyond. Scroll down to see and shop the biggest dress trends right now. You only need one quick browse on the high street to see that polka-dot dresses are sticking around for the new season. There are all manners of polkas on offer, from ASOS's white and red polka dot look to Valentino's dramatic red midi. This trend might have seemingly come from nowhere, but green floral midi dresses have continued to sell out at record speed. 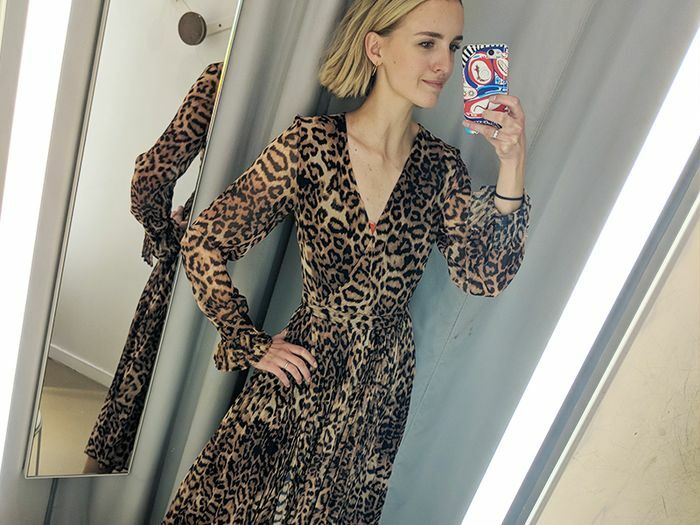 Kitri's £145 Gabriela dress had a waiting list of over 800 people, and styles from Arket, ASOS and more are selling like hotcakes. Leather dresses are the somewhat niche trend that has won over the fashion crowd this season. From Nanushka's wrap styles to Warehouse's western-inspired mini, there are so many looks to choose from. The key is to keep everything else pared-back—think '90s-style ankle boots and a contrasting wool camel coat thrown over the top. You won't need to add a base layer, as the dresses are warm enough by themselves. Flattering, versatile and ideal for any occasion—every wardrobe needs a wrap dress. Take your cue from Jessie Bush and style a fuschia pink wrap dress with chunky trainers, or go for something directional and try Anna October's geometric iteration—you'll get so much wear out of this one. The humble slip dress has had something of a new-season makeover, and as result is looking chicer and more fun than ever. Look for subtle style updates (think side splits, cowl necks and structured silhouettes), and team with everything from slides to sneakers or heels. Hannah Lewis makes her Zara piece work for the colder months with a slim-fit polo neck base-layer. This has got to be the one of the biggest dress trends for autumn/winter 2018. Featuring long sleeves, knee-grazing length and, often, a high neckline—this is modesty dressing in the mainstream. Great for layering, the midi dress 2.0 works well over a polo neck or under a baggy knit and was born to be worn with knee-high boots. So which dress style are you eyeing? It wouldn't hurt to try all of them, you know.